Limelight Christmas Day Two is Lee! Check out her game/prize here! Please buy my copics! Click here. I had the main piece laying around, so I put it on a card, lol! A pretty quick and easy one for you today. Thanks for stopping by! Quick, easy, and super cute! This is great, Becky! I love the red with the brown...and then the pop of green with the button! Wonderful! 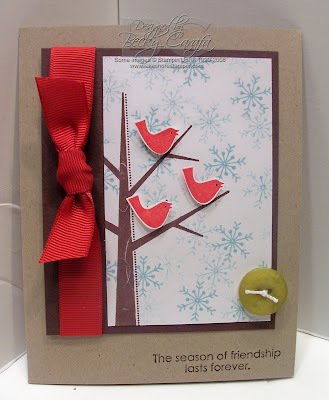 such a sweet card becky..love the pops of red!! This is darling, Becky! Love the birds in red!! Great card Becky! That red really does set it off. Love the button down in the corner also. super cute, I love this stamp set! LOVE this card! May be quick and easy...but it looks DARLING! I may need to try one of these myself. :) I love it!